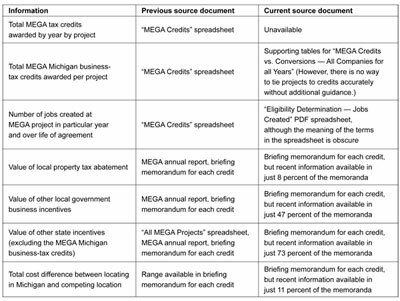 As noted in the preceding sections, nearly every major document furnishing important information about the MEGA program has become less detailed and less useful. Graphic 13 helps indicate what information is no longer available. The first column of the graphic lists the information in essentially the same categories that appear in "Measuring MEGA's Efficacy" above. In Graphic 13, the columns "Previous source document" and "Current source document" refer, respectively, to where the information was originally located and to where the information is now located — if it is available at all. Note that in several instances, the "current source" column indicates a particular piece of information is available only a certain percentage of the time (the percentage is calculated for MEGA briefing memoranda produced from July 2008 to December 2008). 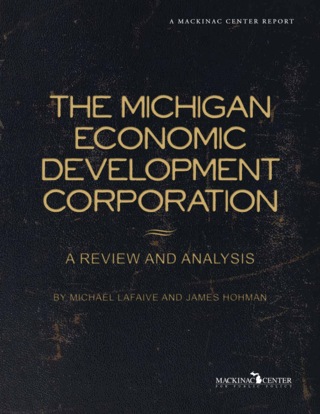 The percentages range from 8 percent, for local property tax abatements, to 73 percent, for other state business incentives other than MEGA's Michigan business-tax credits. All of these figures used to be 100 percent. As the graphic makes readily apparent, much of the basic, necessary information about MEGA is now unavailable or no longer readily accessible.